Campbell found black comics heroes like Luke Cage, The Falcon, and the Black Panther to fly him out of his Pittsburgh suburb. 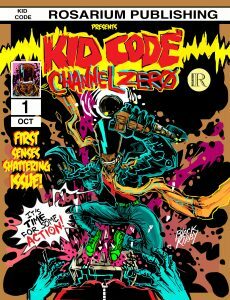 John Jennings, one third of the Black Kirby/Tan Lee team that created Rosarium’s “Kid Code,” took a different approach as a kid, mentally bypassing the race difference between himself and his fictional heroes. 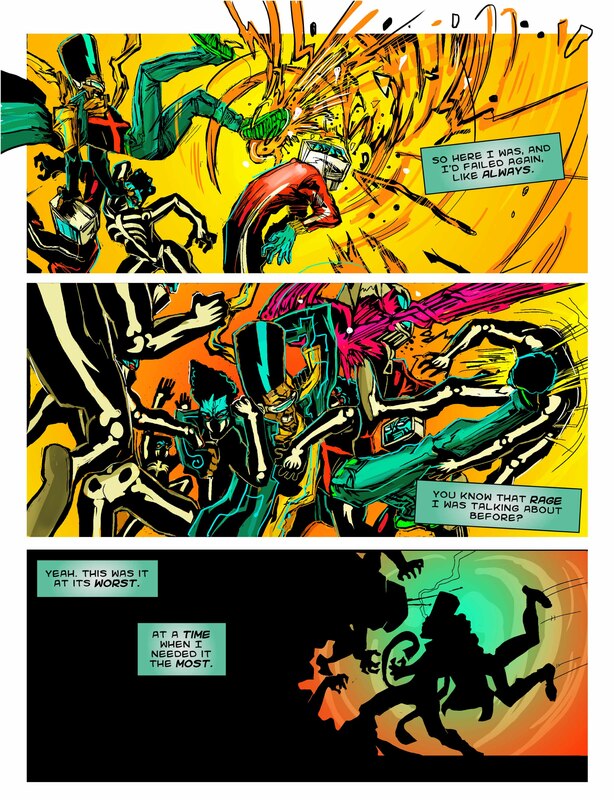 He cites Jack Kirby’s “Thor,” the first comic he ever read, as his initial inspiration: “I began drawing and never stopped.” “Black Kirby” is the name chosen by Jennings and his co-author and illustrator Stacey Robinson to both honor and remix the name of the legendary comics artist, writer, and editor. Damian Duffy, the third member of the “Kid Code” team, chose the name “Tan Lee” to echo writer Stan Lee, another comics legend, known for creating—often with the help of Jack Kirby’s illustrations—iconic superheroes like Spider-Man and the Fantastic Four. 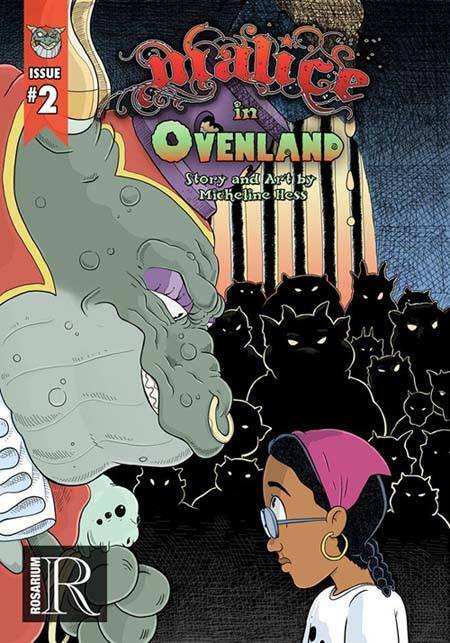 Hess’s “Malice in Ovenland” certainly delivers on adventure—kids will get sucked into the story no matter their race—as well as visual and verbal humor. When “Malice” begins, young Lily Brown, a native of Queens, New York, is stuck in a dungeon puzzling over who her captors are, how she got there, and whether or not, as hungry as she is, to eat a nasty lump of grease that a guard has tried to pass off as food. 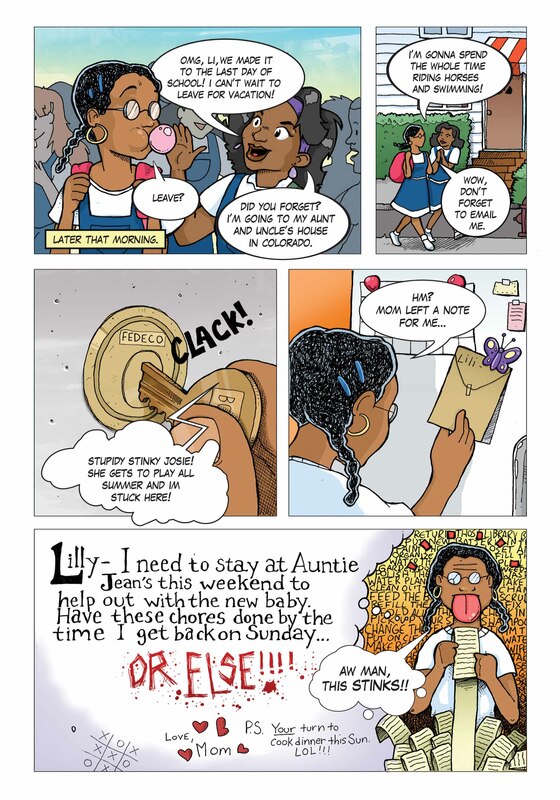 As the backstory unfolds, we learn that Lily’s mother has recently tried to adopt a healthier diet, and Brown often pines for the fast food that she used to eat. Brown also mourns being stuck home alone doing chores, while all her friends are escaping the city for summer vacation. Hess definitely has her finger on the pulse of her young audience, mining the playful gross-out factor kids adore. 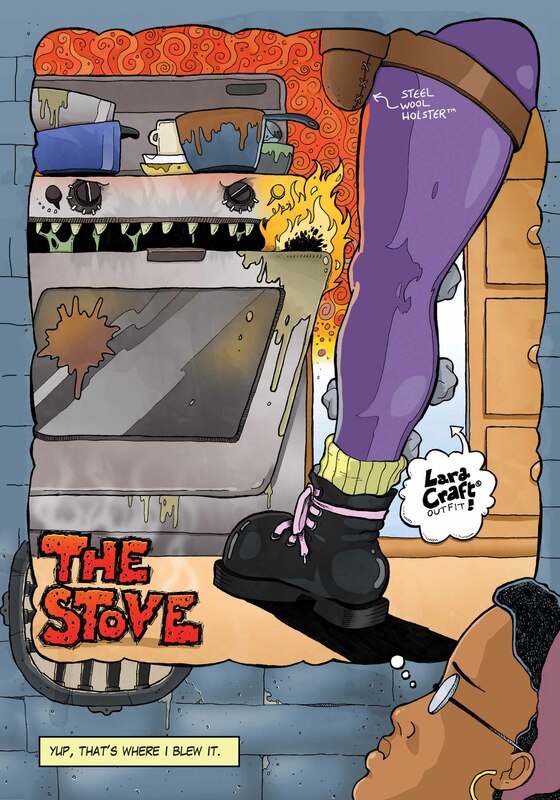 Another expert touch for young readers is her cute—but not too cute—sidekick Crumb, the creature hiding below the burner in the image below, a mash-up of Gollum, Dobby the House Elf, and the White Rabbit. 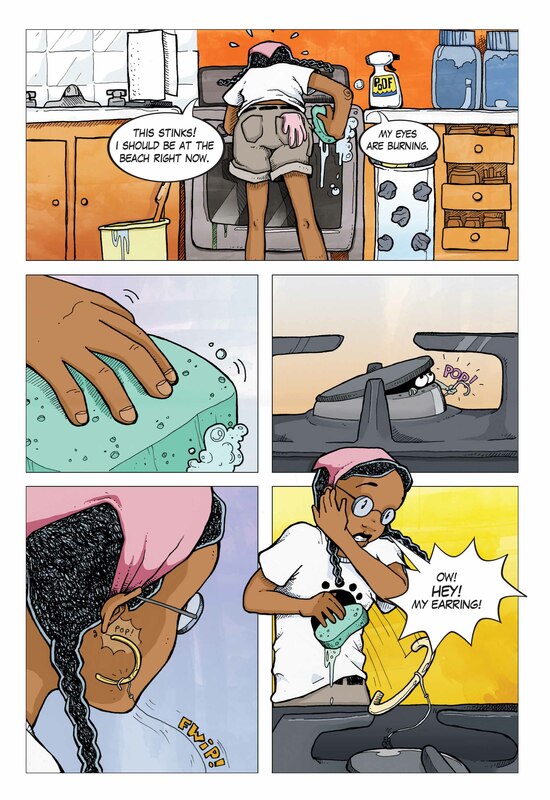 Jennings’s “Kid Code” also runs on mash-up and remix, but for grownups adept at code-switching between both high- and (supposedly) lowbrow culture, between Modernist literature and hip hop. T.S. Eliot’s “patient etherized upon a table” from “The Love Song of J. Alfred Prufrock” becomes “impatient etherized upon a turntable.” The title of Wu-Tang Clan’s 1993 track “C.R.E.A.M.,” which stands for “Cash Rules Everything Around Me,” represents The Power, the evil force that Kid Code has been recruited to battle. Don’t get all the references? I’m sure I missed a lot, but explosive illustration and humor—especially the insults, like the “wannabe Doctor Who Scarf” and the “Bride of Frankenstein haircut”—carry the story. Kid Code is a soldier for Father Time, a benevolent force in the universe who, along with his right-hand woman Roxy Clockwise, is trying to locate and re-form (re-mix, MC style) the shards of “cosmic LPs” on which the God MC recorded the keys to the universe. Too much backstory? Just enjoy the ride. This is the first time I’ve reviewed single issues rather than collections, but these two digital titles represent an increasingly important medium in comics. 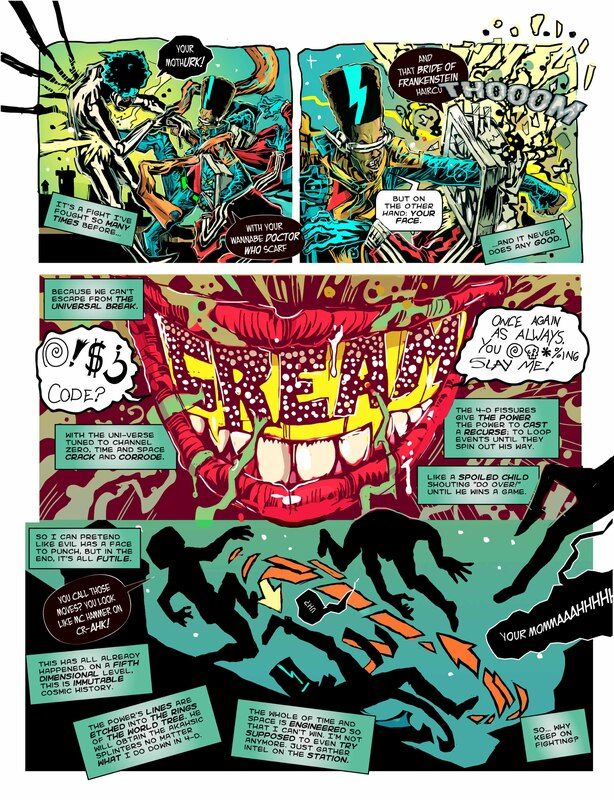 The explosion of digital single-issue access through platforms like Comixology has helped a broader range of comics writers and artists, rejected by too-conservative mainstream publishers, find and grow their audiences—especially audiences without access to brick and mortar comics stores or bookstores. These two first issues are available for download for just a couple of dollars. 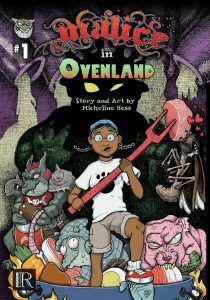 Keep an eye out for print versions of Rosarium titles that succeed online—but in the meantime, you can join my five-year-old son in his impatient wait for the next installment of “Malice,” due out in March 2015.